As I have mentioned before we collect Funko Pop Vinyl collectable figures. Neil and I have 103 Pops between us at the moment and our collection is always growing. The great thing about Pops is they are for the most part extremely affordable. There are thousands of them to collect with figures from films, cartoons, tv shows and more. We get most of our collection from the local comic book store "Comics N Toys" here in Kidderminster. They have a great range in the shop with new ones coming in all the time. You can also see which pops are available on the Comics N Toys Facebook page. You an also purchase them from the shop too as they do post in the UK too, just drop them a message through Facebook for more info. One of the most popular Disney collects is the Frozen collection (the film is brilliant) and my friend Debs had a spare Olaf and she said I could give him away on my blog to one lucky reader. He is so cute. Do you own any Pops? Which cartoon/film/tv character would you like to see as a Pop? To enter the competition simply complete as many of the steps as you wish on the Rafflecopter form below. A winner will be chosen at random at the end of the competition. The competition is open to residents of the UK only. Good Luck. Fab! They are great to collect. We keep ours in boxes on shelves. Running out of space though. No we don't own any of these figure but I would love to see a Bagpus to remind me of my childhood! Bagpuss would be so cool and cute! I have a few Breaking Bad and Walking Dead ones.....I would love to see more WWE ones! Ive never heard of pops before. now off to look at them though. something nice for the children to collect. No,I don't have any but Dangermouse would be good. I don't own any yet but would love to start collecting! I'd love to see Parry the Platypus from Phineas and Ferb as a pop figure! I've never even heard of them! A Stitch one would be fab though! Maybe some other Disney film characters like 'Mrs Potts & Chip' from Beauty & the Beast. I've seen them and they're awesome. I have my eye on a few sets to collect. I'd love to see more of the Buffy characters as pops, they already have a few.. but not all of them. I love pops! Would like to see a Corpse Bride one. I don't own any yet, but I think they'e so cool! 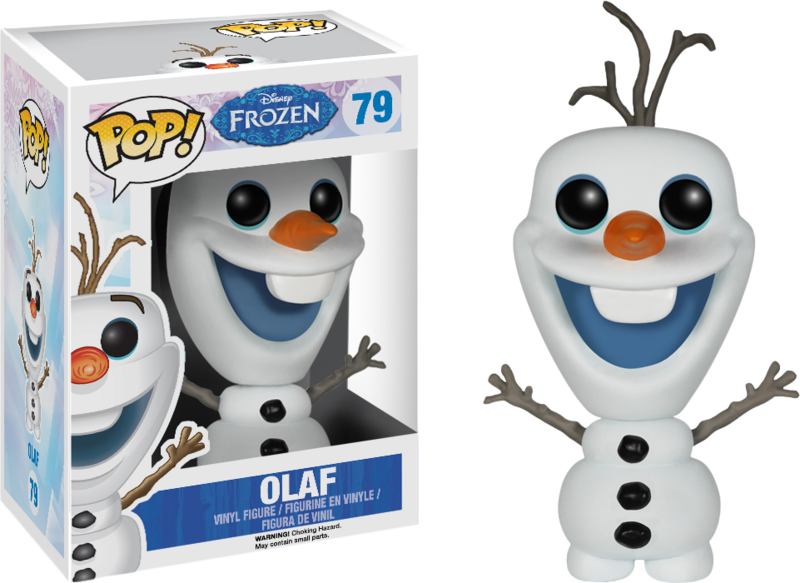 I don't own one yet but they look adorable Olaf is by far my favourite character ever so what a perfect place to start! I'd like to see Utpoia pops. I've got a number of pops but there aren't any for Heroes as of yet. I would like to see some when Heroes Reborn starts! we have a minion pop, I'd love to see more characters from despicable me such as agnes or her unicorn! I have some Game of Thrones ones but Olaf is my spirit animal ha! It would be great to see some of the muppets! I haven't got any but I have seen them in the shop and my son keeps going on about them. I would love to see a Captain Jack Sparrow. I don't own any but I would love to. Wouldn't it be great to have a Mr Men Character. They were so iconic for so many children. I don't but simba from lion king would be good! I don't have any Pops yet, but would love to start collecting them. I especially want The Walking Dead ones. We don't - but would love too! I don't own any Pops, but my stepson keeps buying them for people as presents, so one day, maybe! (Not!!) I'd love to see the Winnie-the-Pooh collection! i love pops they are all so cute! don't have any but would live some avengers ones! I don't own any but would love to. We don't own any yet but my son would like a spongebob one. I would LOVE to see a Pop Figurine of more Disney characters, maybe Mulan or Ariel, or South Park characters; that could be cool! I don't have any but we would love a Peppa Pig one ! A Peppa pig one would be ace! I don't own any, but have given some as gifts. I would like to see a Bananaman figure. I don't own any at the moment. I would like to see Gilbert from Gilbert's Fridge. we dont own any, but im so excited by the friends ones that are coming out! I don't have any but I do love Olaf as I collect snowmen. Never heard of pops but think Homer Simpson would be good. I own an Iron Man Pop, and would love to see a Flash Gordon pop! I dont have one, but a Harry Potter one would go down well in this house. I don't own any, would love to see the characters from the Land Before Time. I don't own any but I know my husband would love to collect Star Wars ones. None, I've never seen them before! My brother and his wife have some, but I don't have any. I would like to see a Rainbow Brite one as a childhood flashback. i don't own any. would love Pinky and the Brain pops! I do not own any, but I would love to see minions as a pop! Not got one yet but my crew mate and I would like to see little ambulance people! I don't have any and would like to see some Lego ones. we've got a few :) my oldest loves them. I own some WWE ones but would love to see some 80's cartoons made into Funko like Danger Mouse, Count Duckula, He-man ect. We don't own any but I would love to see Snoopy as one. Thank you! Don't own any but if I win could start me off! My OH has a couple of Marvel character ones. i love pops ! i really really want the walking dead ones ! Don't own any, but bagpuss would be good. I love the marvel ones, super cute!! I'd love a Batman one... Think you should make a Mr Bean Pop!! I have not seen my grandchildren with any. I would like to see Bagpuss as one. I love them! I've got 2 Game of thrones pops, black widow, thor, simba and WWE pop. I'd love it if they made Steven Universe ones. My son collects Star Wars and Marvel figures. I've got a Groot ! !